Donkey Kong swinging on a Banandelion in Donkey Kong Jungle Beat. Banandelions are common objects that first appear in Donkey Kong Jungle Beat. They are long dandelion-like plants that are usually found in grass-themed levels. Donkey Kong can cling to one by clapping near it. Pounding on the bongos, alternating between the two drums, or flicking the control stick causes Donkey Kong to swing along the stem toward the top, and at the top the flower automatically flings Donkey Kong in the opposite direction. Bee Mario next to a Banandelion in the Honeyhive Galaxy in Super Mario Galaxy. They reappear in Super Mario Galaxy and Super Mario Galaxy 2, redesigned as pink flowers. When Mario performs a Spin move next to one, he will automatically grab onto it, much like he would with a Sproutle Vine. He can also grab onto a Banandelion by simply jumping toward its long stem. Once Mario has grabbed onto one, he must spin repeatedly, which will cause him to gradually travel farther up the long stem of the flower. When he gets to the end of the flower, it will fling him through the air to another area. The flower itself is usually curved to the side in a particular direction. This indicates the location of the area that it will fling Mario to when he spins next to it, as it is always curved away from the area that it flings Mario to. Mario about to use a Banandelion in the Rightside Down Galaxy in Super Mario Galaxy 2. In Super Mario Galaxy, Banandelions make their first appearance in the "Bee Mario Takes Flight" and "Big Bad Bugaboom" missions of the Honeyhive Galaxy. In the former, the player encounters two Banandelions on the Flower Planet which must be used so that Mario can successfully reach one of several spinning flower platforms floating just above the planet's surface and subsequently progress through the level. In the latter, the player must make their way to the Bugaboom Planet by using some Banandelions found on two small platforms next to the planet. Several additional Banandelions are also positioned at various intervals around the perimeter of the Bugaboom Planet, and can be used to fling Mario into the air to attack Bugaboom as the battle progresses. A Banandelion also appears in the Gold Leaf Galaxy in the "Star Bunnies on the Hunt" mission. The player must use this Banandelion to access part of the Starting Planet that's normally inaccessible without it in order to collect all five blue Star Chips and continue through the mission. In Super Mario Galaxy 2, Banandelions first appear in the Rightside Down Galaxy in the "Breaking the Laws of Gravity" and "The Great Crate Incinerator" missions. In both missions, the player must use Banandelions in certain areas to fling Mario to different locations with varying directions of gravity. The final appearance of the Banandelion in this game comes in the Honeyhop Galaxy. In this galaxy, two Banandelions are encountered, one on the Starting Planet and one on the Queen Bee Planet. On both planets, the Banandelions are used to allow Mario to reach high-up areas that would normally be inaccessible without the use of the plant. ↑ "DK will spin toward the tip of a Banandelion and perform a big jump!" - New Play Control! 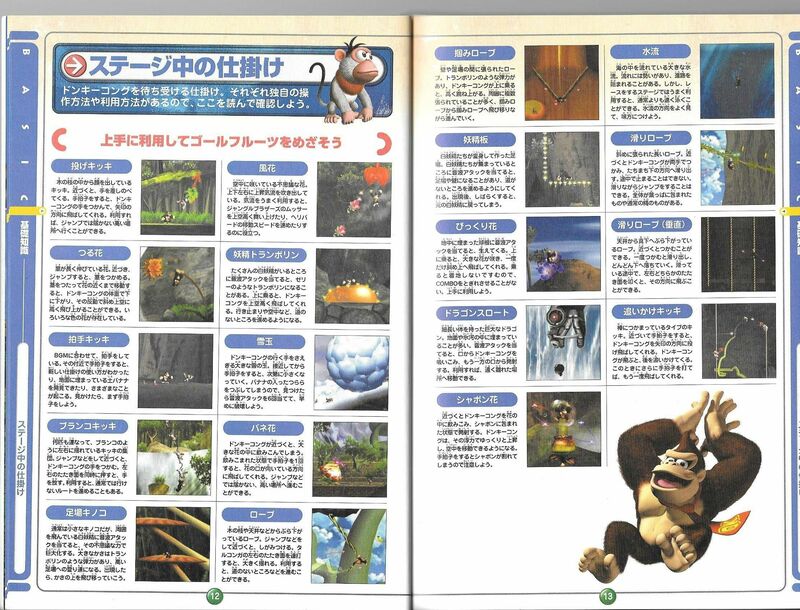 Donkey Kong Jungle Beat instruction booklet, page 16. ↑ Donkey Kong Jungle Beat Shogakukan book. Page 12. ↑ Shogakukan. 2015. Super Mario Bros. Hyakka: Nintendo Kōshiki Guidebook, Super Mario Galaxy section, page 136. This page was last edited on March 3, 2019, at 09:50.